The legendary Alice Waters of Chez Panisse pioneered the farm to table movement. In her fabulous book Fruit, Ms Waters includes recipes that specify spirits distilled from fruit, eau-de-vie and aged brandies, over and over. From Brandied Cherries to the filling of her Domed Berry Cake. In the Apple Custard Tart and Poulet a la Normande. Black Currant Ice cream and Raspberry Coulis. Knowing she is passionate about good spirits, we gifted a bottle of our all-Connecticut Pear William to her at a book signing. In a handwritten postcard we received from Ms Waters she says, “Dear friends at Westford Hill: Thank you for that exquisite bottle of eau-de-vie de Poire! I was very impressed. Alice Waters.” Whether she sipped it or splashed it over her Butternut Squash and Pear Puree, who knows? Maybe both! When there is seasonal or dried fruit in a recipe, a splash of Westford Hill eau-de-vie will make it taste even better. Try it! Find additional recipes from our Featured Chef. Cover noodles with boiling-hot water and soak 15 minutes, then drain well in a sieve. Drain and toss with vinegar. Fill a shallow baking pan with warm water. Soak 1 rice-paper round (make sure there are no holes) in warm water until pliable, about 30 seconds, then transfer to work surface. Arrange 3 pieces of shrimp on bottom half of soaked rice paper, leaving a 1-inch border along edge, place ¼ of basil, ¼ each of mint and cellophane noodles on top. 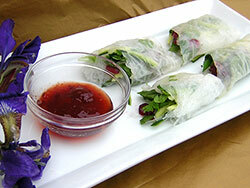 Roll up rice paper tightly around filling and, after rolling halfway; arrange ¼ each of cilantro, cucumbers, carrots, scallion and cherries along crease. Then fold in sides and continue rolling. Transfer summer roll to a plate and cover with dampened paper towels. Make 3 more rolls in same manner. Cut each roll on the diagonal and serve. Summer rolls may be made 6 hours ahead and chilled, wrapped in dampened paper towels in a sealed plastic bag. Bring rolls to room temperature before halving and serving. Mix all ingredients together and put into small dish for dipping. Slice rhubarb (or thaw if frozen. Do not drain.) In a bowl mix sugar, flour, and cinnamon. Add rhubarb and juices and the eau-de-vie. Add strawberries if you have them. Toss until coated. Transfer filling to an ungreased 8 x 1-1/2 inch baking dish. For topping, stir together oats, brown sugar and flour. Using a pastry blender, cut in the cold butter until the mixture looks like coarse crumbs. Sprinkle topping on the filling. Bake at 375 degrees for 30 minutes or until rhubarb is tender and the topping golden. Can be served warm with ice cream or whipped cream, or at room temperature. Leftover crisp is also tasty with yogurt for breakfast—just toss in a few walnuts. Doubling this recipe makes it a great way to feed a crowd. Combine all ingredients (except strawberries) in a bowl and mix well. Refrigerate at least 1 hour before serving. You can either put into a bowl and use as a dip for the strawberries or spread on a serving plate then arrange and lightly press strawberries into dip.